By scrutinizing data from large transactions, valuation experts can glean important information and insights into current healthcare valuations. In this article, Collin McDermott and Bridget Triepke summarize SEC filings, review the implied valuation of large healthcare mergers—based on the purchase price—and provide a detailed review of the fairness opinions provided by investment banks to both Vanguard’s and Health Management Associates board of directors and shareholders. Specifically, the authors detail the results and key assumptions utilized by the investment banks for the GPCM, M&A Method, and Discounted Cash Flow Method. Data derived from researching large hospital transactions provides the healthcare valuation community with significant insight into the current hospital transaction market. 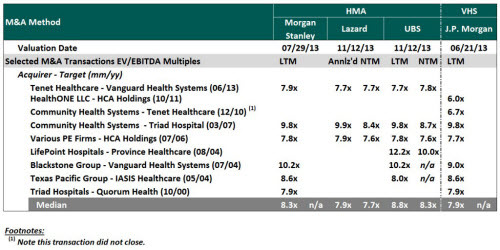 The acquisitions of Vanguard Health Systems (Vanguard) by Tenet Healthcare Corporation (Tenet) and Health Management Associates, Inc. (HMA) by Community Health Systems, Inc. (CHS) are particularly meaningful as each transaction involved large public organizations on both sides of the transactions (Vanguard and HMA are collectively referred to as the “targets,” while CHS and Tenet are collectively referred to as the “acquirers”). Public information is readily available through press releases, analyst reports, and Securities and Exchange Commission (SEC) filings. Utilizing the SEC filings, we have reviewed the implied valuation of each company based on the purchase price along with a detailed review of the fairness opinions provided by investment banks, which were relied upon by both Vanguard’s and HMA’s board of directors and shareholders. 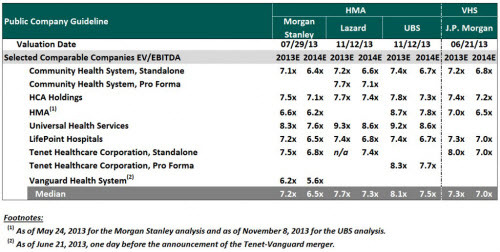 The acquisition of Vanguard by Tenet was announced during June 2013, and the transaction closed on October 1, 2013. The enterprise value1 of Vanguard was approximately $4.3 billion. Vanguard’s revenue and earnings before interest, taxes, depreciation, and amortization (EBITDA) was approximately $5.9 billion and $523.9 million2, respectively. Therefore, the implied enterprise value multiples were 0.7 times revenue and 8.2 times EBITDA. The acquisition of HMA by CHS was announced during July 2013, and the transaction closed on January 27, 2014. The enterprise value of HMA was approximately $7.6 billion. HMA’s revenue and EBITDA was approximately $13.0 billion and $1.7 billion3, respectively. Therefore, the implied enterprise value multiples were 1.3 times revenue and 8.7 times EBITDA. HMA retained Morgan Stanley, Lazard, and UBS (collectively referred to as the “investment banks”) to act as financial advisors in connection with the sale of the company to CHS. Each of these investment banks issued a fairness opinion4 on the transaction to the HMA board of directors. The assumptions utilized in each opinion were subsequently detailed in the Amendment No. 1 to Form S-4 Registration Statement of CHS, which was filed on November 18, 2013. Similarly, Vanguard received a fairness opinion from J.P. Morgan, which was presented in the information statement pursuant to Schedule 14(c) of the Exchange Act filed on July 10, 2013. Investment banks rely upon many different types of analyses before issuing a fairness opinion for a proposed transaction. Typically, analyses utilized by valuation professionals when issuing a fairness opinion include the Guideline Public Company Method (GPCM), Merger And Acquisition Method (M&A Method), Discounted Cash Flow Method, leveraged buyout analysis, analyst price target analysis, and historical trading analysis. Many of these analyses are consistent with the approaches utilized to provide a fair market value opinion. We review the results and key assumptions utilized by the investment banks for the GPCM, M&A Method, and Discounted Cash Flow Method. The GPCM is a method within the Market Approach whereby market multiples are derived from market prices of stocks of companies that are engaged in the same or similar lines of business, and actively traded on a free and open market. Market multiples are developed by dividing the value of a publicly traded company’s stock or invested capital by a financial measure, such as revenue, EBITDA, or net income. These multiples provide an indication of how much a knowledgeable investor in the marketplace is willing to pay for a company. Below is a summary of the guideline public companies and multiples utilized by the investment banks in their GPCM analysis. A review of the GPCM presented by the investment banks reveals the set of “comparable” companies to the targets; these were obvious to valuation professionals. Additionally, all the investment banks considered estimated FYE 2013 EBITDA and estimated FYE 2014 EBITDA in their analyses; none of the investment banks utilized a metric of revenue. Several of the investment banks considered a pro forma EBITDA based on the proposed combined entities (e.g., CHS and HMA post-transaction or Tenet and Vanguard post-transaction). In view of the fact that all of the investment banks isolated the same public hospital comparables and utilized similar earnings metrics, all investment banks presented similar results. As detailed in the chart below, the selected multiples utilized for the targets were in the 6.5–7.5 times EBITDA range based on 2013 figures5 for all three investment banks, which presented their conclusions. The M&A Method is another method within the Market Approach whereby pricing multiples are derived from transactions of control interests in companies engaged in the same or similar lines of business and then applied to the subject business or business interest. This method reviews published data regarding actual transactions in either publicly traded or closely held companies. Below is a summary of the comparable transactions and implied multiples utilized by the investment banks in their analyses. 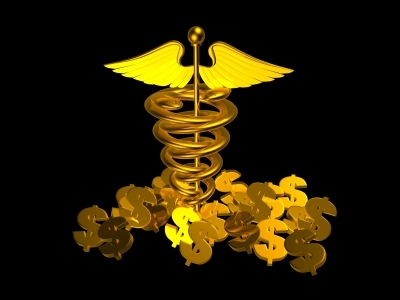 Based on a review of the selected precedent transactions utilized by the investment banks in the M&A Method, it is interesting to note that the investment banks presented transactions as early as 2000, despite the fact that the hospitals operate in a very different post-reform healthcare environment. The investment banks did not disclose if all of the transactions were weighted equally or if certain transactions received a higher weighting. Finally, the M&A Method supports a higher multiple of EBITDA than the GPCM. This is consistent with the fact that the buyer is purchasing a controlling interest with potential synergies (depending on the buyer) as compared to the results of the GPCM, which results in a minority interest valuation. The range of selected multiples utilized by the investment banks under the M&A Method compared to the GPCM was broader (7.0–10.0 times EBITDA) and were generally applied to a different measurement of EBITDA (e.g., trailing 12 months, estimated 2013, or next 12 months). This approach requires more subjectivity by the valuation professional as there are more potential comparable transactions to choose from, greater subjectivity regarding which transactions are the most relevant based on size, date, and other factors, and the variability in the availability of consensus and pro forma EBITDA estimates across the transactions. Therefore, it is reasonable that each investment bank utilized a different range of EBITDA measurement to capture the value they believed to be most reflective of the value of the target. The Discounted Cash Flow Method estimates value by projecting a future income stream attributable to a business and then discounts those earnings back to present value. A review of the key assumptions utilized by the investment banks in their DCF analyses is especially meaningful as it provides insight as to how the investment banks (along with the acquirers) view the future and risk of achieving the future results. Each of the investment banks relied on a forecast provided by the targets’ management6. Assumptions utilized have been summarized in the “Cash Flow Assumptions” section of the chart below. Revenue growth for both of the targets, which includes the effects of acquisition, was generally modest, around four percent compounded annually over a five-year forecast period. Although revenue growth was fairly similar between the two targets, EBITDA growth and EBITDA margin assumptions were different. Although the process of determining a discount rate is very subjective—as there are several acceptable methods that require the selection of various subjective assumptions—the range of estimated rates is very narrow (7.0–8.0 percent). This implies that there is consensus among these large investment banks about the business risk of the underlying operations of the targets even though the healthcare market is undergoing reform and consolidation. However, we note that there was a divergence among the investment banks in the selection of the long-term growth rate, which resulted in a variance in the implied capitalization rate (discount rate less long-term growth rate). As a healthcare valuation professional, it is crucial to analyze key assumptions and variables utilized in notable comparable transactions within an industry segment. This information provides valuation professionals with additional market data points and observations regarding assumptions on risk and the industry outlook that should be considered and incorporated in current healthcare valuations. The summary also provides practitioners with the practices and views shared (back in 2013) by the large investment banks regarding healthcare system mergers and acquisitions. Colin McDermott, CFA, CPA/ABV, is a senior manager with VMG Health and is based Dallas, Texas. He specializes in providing financial, valuation, and transaction advisory services to clients in the healthcare industry. Mr. McDermott’s clients have included hospitals, hospital systems, ambulatory surgery centers, imaging centers, laboratories, physician groups, and other healthcare entities. Additionally, Mr. McDermott has assisted numerous healthcare clients with their annual impairment testing process as required by ASC 350 Intangible-Goodwill and Other (formerly SFAS 142). Mr. McDermott can be reached at (972) 616-7808 or at collinm@vvmghealth.com. Bridget Triepke, CPA, is a manager with VMG Health. She has six years of experience performing valuation and financial advisory engagements for the purposes of financial reporting compliance, tax planning, and merger and acquisition planning. Mrs. Triepke is a part of VMG Health’s accounting related valuation services team. Mrs. Triepke can be reached at (972) 616-7779 or bridgett@vmghealth.com. Note: Data research contributions provided by Brent Davis. 1 Enterprise value, as defined by Capital IQ, is market capitalization less cash and short-term investments plus total debt plus preferred equity and plus total minority interest. 2 Based on Vanguard’s trailing 12 months ending March 31, 2013. 3 Based on HMA’s trailing 12 months ending June 30, 2013. 4 A fairness opinion provides an independent objective analysis of the financial aspects of a proposed transaction from the point of view of one or more of the parties to the transaction. 5 Multiples for Vanguard are based on the FYE June 30, 2013. 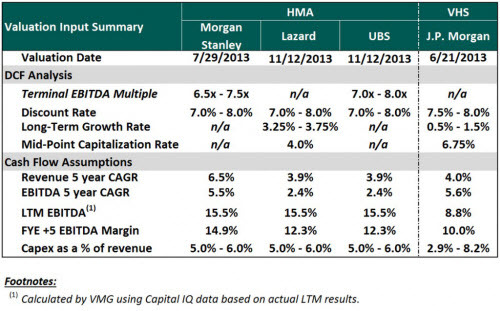 6 It is important to note that Morgan Stanley utilized a different set of forecasts for the HMA acquisition from Lazard and UBS.